1) To decide you want to make meaning not money. 2) Make a mantra for your organization – a 2 or 3 word statement of why your company should exist. 3) A matter of perspective – don’t stay on the same course, but jump to the next perspective. Most companies define themselves by what they already do. It is not the process it’s the benefits. You need to get to the next curve. 6) Let A Hundred Flowers Blossom – at the start of great innovation take your best shot at branding and positioning. Often you will see innovation by the customers and your buyers may not be from the target market you anticipated. Instead of trying to correct to get what you think is your target market, ask your buyers why they are buying and give them more reasons to buy. 7) Polarize People – the consequences of great products is that they polarize people. The worst case is not that someone hates you or your product, but that nobody cares. 8) Churn Baby Churn – Shift the revolution, and the churn, to various versions. In the beginning – be in denial and ignore people – then reverse and listen to what people are telling you. Constantly churning the process will give you better and better versions. 9) Niche Thyself – Products can be positioned on charts to reflect their Uniqueness and their Value. The bottom right corner shows you have created something of value but it is not unique – here you can make money but it is hard work with all the competition. The upper left corner shows you have created something unique but of no value – you will make no money. The bottom left corner is the worst corner, you have no value and it is not unique – you will make no money. The upper right corner is the best, you have value and it is unique. Customize your intro to your audience. Know who you are pitching to, create your avatar. When making a personal presentation remember the 10/20/30 rule. 10 slides are optimal, in 20 minutes with a 30 font size. Don’t let the Bozos drag you down. Just because someone presents as Rich & Famous, they could just be lucky and not smart. Often they can’t make the jump to the next curve. Dr. Hymel in his talk offers personal insights into understanding failure. We must first understand that untested assumptions and bias are part of who we are. We must learn to upgrade our world view based on what our failure has taught us. Mistakes when actually acknowledged are opportunities to update our model of the world and how it works. It is the chance to really test our limits and get to the heart of our bias. Hymel tells us our brains are wired against us, and is not objective. In fact how we evaluate new things is deeply influenced by our existing assumptions (which in many cases are untested and untrue). Innovation can not occur without set backs and failures. We need to step back and take the time to process the unexpected using your entire brain – think it through. Often acting in a knee jerk manner is the wrong reaction and you will decrease your chances of learning from the experience. He says: “Being a beginner helps you quiet the negative voice.” By starting something new, you move away from your bias, because you have no frame of reference and you can learn … how you learn. This in turn will refresh your mind and will allow you to better succeed in your profession, your life. He advocates learning a new skill or a new language – something out of your ordinary. Sinek has discovered the concept of the golden circle which shows that inspirational leaders work from their “why”. Why they do what they do, why they believe what they do. Communicating from your why speaks to the part of the brain that controls behavior and we allow people to rationalize that behavior by the tangible things we say and do. In the golden circle he describes three rings, the outer most is the what – “what we do” the next ring is the “how” – the common USP and the inner ring is the Why. The outer ring is controlled in our brains in the neocortex – the homosapien externalized language source, while the inner two rings are based on behavior and feelings. The inner circle the why is the deepest level of response and is only “feelings & behavior” it is not language based. This is where the statement … I don’t know why … it is just a gut feeling – comes from. Sinek is the author of two books, Start With The Why and Leaders Eat Last. He also has an online site where you can take courses to assist you to learn your why. In her interview with Rachel Whetstone from Google, Adrianna discusses the moment that changed and redirected her life. April 6, 2007 when she collapsed from over work and exhaustion. That was her wake up call. And she began examining her life by asking questions like What is a good life? What is Success? She noted that in our patriarchal driven society there has traditionally only been two metrics that measured success, and compared that to a two legged stool – eventually it will fall over. She suggests a third metric – well being – health. She knows that women especially in the workforce have a 40% higher risk of heart disease and a 60% higher risk of diabetes than men. Adrianna says there have been two revolutions for and by women and she would like to suggest a third – women changing the world and outlines this in four sections of her book Thrive – 1) Health 2) Wisdom 3) Wonder and 4) Giving. We have been taught that the way to success is complete devotion to that premise and work it 24/7. That is a delusion the effects of sleep deprivation are far reaching, yes it impacts our health and overall well being, but also our relationships, our creativity, our ability to provide the stimulus for change. Instead she argues for experimenting in how to do things in a different way, with tiny, micro steps – like leaving our electronic devices to charge outside of our bedrooms, not answering the phone or checking for data, messages in the middle of the night, using an old fashioned alarm clock instead of our cell phones, having a land line with no data capabilities just for answering in an emergency. “We are wired for giving” Adrianna announces later in this talk – our markers for disease go down when we are engaging in joyful giving. So find ways to bring back joy to your life, follow your creative passions even if they are not your life’s work or what provides the money, but rather that which succors the soul. 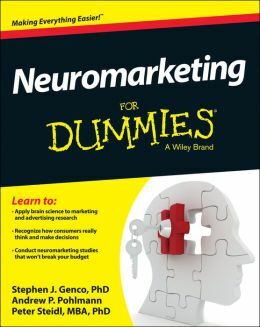 Steve Genco, wrote the book Neuromarketing for Dummies, a very comprehensive book on understanding neuromarketing. In this interview Steve explains how he came to write the book and then provides his insights into where neuromarketing is today. He was approached by the “Dummies” guys to write the book and found that their approach to writing involved a format that was very structured. 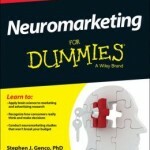 This is the first book to codify all of the different pieces of neuromarketing. His book and the one by Thomas Zoëga RamsØy – Introduction to Neuromarketing & Consumer Neuroscience combine the scientific foundation with the business applications of neuromarketing that have been used in the last couple of years. “Rarely do we get these major jumps in technology which require that certain ingredients all come together at the same time.” says Genco. 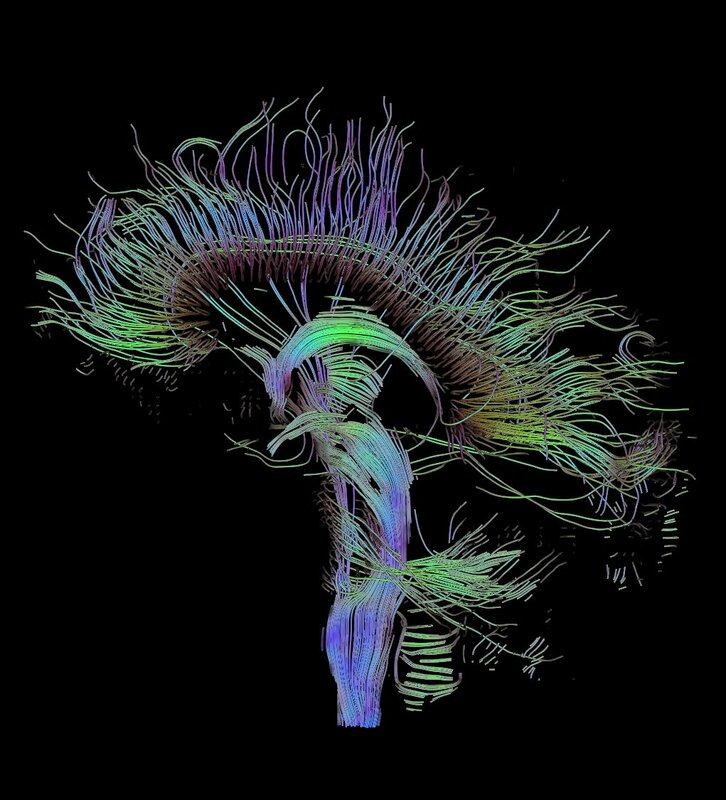 First there was the tremendous advance in brain sciences , the psychology of the unconscious, the introduction of the MRI which caused a flood of knowledge and insights from the brain sciences. At the same time computer power has grown so that what was once a super computer is now a desk top computer. You need this power because there is massive amounts of data analysis required. So you have the technology in place which is cheap and available, you’ve got the scientific insights to guide the work. And third thing is the business world is finally ready to acknowledge the need to go beyond self reporting, verbal reports and surveys to really understand what consumers wand and need. What they’ve learned about the brain is that what really influences consumers is not accessible to the business community in their current forms of methodology. As a result marketing is really exploding all over the globe. All of the major vendors today, are offering some kind of non-conscious measurement as a part of their traditional packages. This combination of science and technology can be sued for testing how people pay attention, how they respond emotionally and how they remember things. The challenge is to have it implemented. They’ve learned that people are resistant to change & they’re resistant to novelty. Marketers that have been successful for 20-30 years are resistant to these new technologies and information. 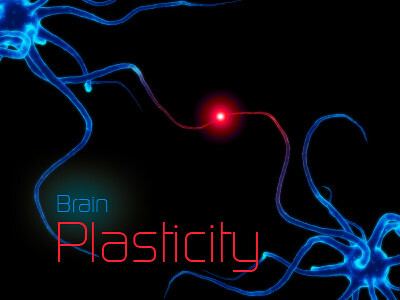 There are some things that still need to be done in neuromarketing – like increase scalability. There is lots of use around the mobile use of light tracking, online eye tracking, online facial recognition. These techniques are much more scalable than lab based techniques. Response time studies in these areas can be done very quickly and inexpensively. SEO Efforts Should Be Centered On Quality. Rand Fishkin, the CEO of MOZ, continues to see quality as the issue in SEO efforts – that is rated by Google, in 2014. Their company has been around for almost 7 years and provide a variety of software solutions for Internet Marketers. The one that most of us are familiar with is MOZ analytics which allows marketers to track their own websites and their competitors. This information gives them great insights into the marketing plan and SEO strategies of similar businesses, which in turn enables them to improve their own SEO efforts. Keyword ranking is one of the functions of the MOZ analytics and gives you a clear picture of your keywords and how they are performing. He discusses two types of sites a small site with a few highly condensed keyworkds, and a larger one with a significant number of keywords – and how using keywords is different in each of them. 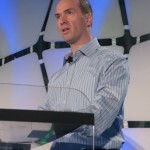 Horowitz sold his previous business Loudcloud and Opsware for 1.6 billion. 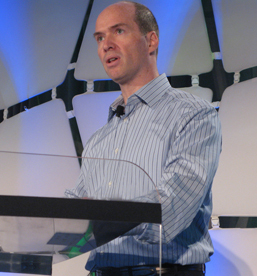 Horowitz and Mark Andreesen have founded Andreesen Horowitz a Venture Capital company, because in their experience the founders should be the CEOs but traditionally entrepreneurs/founders have a model where someone with training as a CEO comes in to run their company. This model did not work for either Horowitz or Andreesen (who founded Mosaic and Netscape). By starting their own venture capital company they want to support entrepreneurs to stay as founders/CEOs. Horowitz has just published a book “The Hard Thing About Hard Things”. He says it is for veteran entrepreneurs as well as aspiring ones. 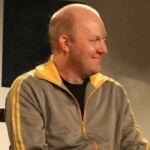 In it he analyzes the toughest problems entrepreneurs face. Very few are honest about how difficult it is to run a new start-up. 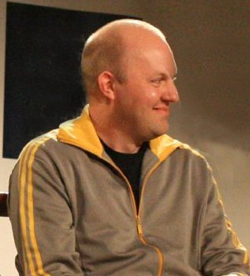 Ben believes that the Accelerators (companies organized to get you connected, known, knock on the right doors to meet the right people) are mostly good. They create a path for entrepreneurs to get recognized with their bright ideas – typically a 20 -25 year old can not break into the market to get the support they need for their start-up. On the negative side the Accelerators can diminish your naivety by surrounding you with “group think”. He advises to keep authentic to yourself, your ideas and your start-up. Avoid group think at all costs. Mark Suster asked: in today’s world with instant communication on all fronts it is extremely difficult to have your company, your ideas trashed publicly – we have all heard of the number of high profile suicides recently – where can entrepreneurs get support? Ben feels that yes this worldwide publicity can be a great stressor, he feels that the entrepreneur is plagued more by the stress they feel coming from within their own company. They feel they are letting them down and this stress is far more significant. The short answer: there is no support out there, sure you can talk to friends but often they have no idea what you are talking about. He says is more about focusing on what you can do. You have to believe you can find the answer and just do not give up until you do. I am taking a course in neuromarketing and consumer neuroscience taught by professor Thomas Zoëga RamsØy. In a recent lecture the professor interviewed Kyle Nel from Lowe’s Innovation Labs. It was a facinating discussion about the fact that neuroscience is just catching on in the marketing world with lots of stops and starts. Nel indicated that the public perception is that it is a shiny new toy, and as such were very interested in it. But marketers today as still stuck in the old model, the old paradigm and are using data mining as their source for moving forward. Nel describes his job as bringing in the next “big thing” whether it pertains to marketing, data, store layout it is just being on the cutting edge as the framework is always changing. Kyle Nel believes that neuro information is so much richer and provides a deeper understanding of consumer habits, spending and overall behavior that lends them to be impacted by the right marketing. People, business owners, bottom line thinkers who are not researchers are more excited about Neuromarketing than professional researchers and are very quick to adapt it. Understanding the consumer comes from neuromarketing. Researchers & data miners have an irrational hold on an old methodology, it you want to incorporate this information you need to get over the obstacle (researchers). Go to the business owner and they will get excited about it and the helps the researchers get beyond their resistance. There is still the stigma that Neuromarketing is too akin to the snake oil salesman. But on the client side they don’t have any of these old perceptions, or what know what to expect or what to ask for. Nel believes that Neuro Science will move gradually into main stream marketing. And those who know it and understand it now, will have the advantage for some time. It is very exciting to see the mobile search with all the gear on (the monitors for heat screen scanning) to show where the consumer is looking as they move through the store. Previously we had nothing, no testing done in retail spaces. They had something called a shop along, which tried to get feedback from the consumer but was mostly unsuccessful. Or alternatively they used surveys at the point of sale – many consumers did not want to participate. The problem with the surveys was that it takes too much for granted – that we asked the right questions, that the respondent understood the question, and that they knew their motivation for purchasing. Surveys are just not qualified. Constant hyper competitiveness shows a lot of flaws in trying to understand consumers choices. Nel suggests that the NBSA Neuromarketing Business Assoc., should be the guardians taking it out of academia, to include more of a laymans version so that the average marketer could read and understand what the emerging Neuro Science is showing us. This is a Google Hangouts Replay of a public webinar with David Perdew from NAMS and Bob Jenkins. Bob is a genius at mind mapping and will teach you tricks you never even knew existed. Make sure you have pen and paper handy as you will want to write much of it down. Jenkins says most users only scratch the surface when they use any kind of mind mapping system, he outlines some of them and talks about the advantages of incorporating mind maps into your planning. This week was mostly taken up with my J.O.B. But I have been working on a secret project and am unveiling it here today. My first animation video, discussing the Quick Start Challenge and the focus for week Four is Monetization. Napoleon Hill with his book – Think and Grow Rich along with Wallace D. Wattles and his effort – The Science of Getting Rich both point us to our own thinking, our mindset. They advise that unless we get that right we will sabotage even our most heroic efforts at attaining wealth. We are told me must hold a clear and definite desire, while at the same time ridding ourselves of all negative thinking. Even modern day writers harp on this same subject Andy Shaw in a Bug Free Mind talks about the bugs that inhabit our thinking producing negativity that eventually sidelines us. While Shirzad Chamine in his work Positive Intelligence says we have 10 Saboteurs The Judge, Stickler, Pleaser, Hyper Achiever, Victim, Hyper Rational, Hyper Vigilant, Restless, Controller and the Avoider. But he also shows us our Sage. It is the sage perspective of accepting what is, accepting every outcome as a gift or an opportunity that moves us out of our negative thinking. The sage has five powers that we can use as resources, strengths when we understand how. They are empathy, exploration, innovation, navigation and decisive action. We need to train our minds to think differently, to believe that we already have what we want which will cause our actions to bring it into our lives. Eban Pagan puts it differently. He says we need to establish new habits that support our mindset. One of those he advocates is productivity. If we set up a program to manage productivity and sustain it for 30 days we will have achieved a new habit that will become second nature to us. The trick he says is to do it first thing in the morning before the “bugs” ”saboteurs” and negative thinking have had a chance to derail our day. By achieving more productivity, creating this new habit we strengthen our resolve and our mindset to achieve success. Solution driven mindset. If you have a problem find the solution or some other way to mitigate it or redirect the problem toward success. If you see a problem in the making, avert it. If you can’t then understand and learn from the experience so that you won’t make that mistake again. Fake it ‘til you make it or act and behave like you are already rich. To achieve this ask: if I am already rich, what would I do, how would I act, how would I feel, and then act, feel and do it. By behaving and acting rich, you are teaching your mind that you are expanding your limitations, and as you practice this you will begin to purchase more of the things you want in your life and the money will come to you to pay for them. An Attitude of Gratitude. Bob Proctor tells of his beginnings on the road to wealth, he used to have a mantra he said everyday – and one day he realized it was now true. He used to say “I am so happy & grateful now that money comes to me in increasing amounts from multiple sources on a continual basis. Thank you.” Another of the ‘Gurus’ from The Secret keeps a stone in his pocket so that every night when he empties it, he is reminded to be grateful and acknowledge all that he has. In order to attract money into your life, your subconscious mind must be open to the idea of money flowing to you. You must have a strong desire to achieve. In order to make the desire strong enough you have to know your “why” what is your motivator? Whatever the reason may be, you must have a strong one to earn money online successfully, because this is what determines your motivation and is the main source of your strength. Every one of us online has a different why, some differences are subtle and others are not. For some the money is the why, for others it is the positive reinforcement of success, or perhaps lifestyle changes, working independently setting your own schedule, retiring in comfort, seeing your children through school and settled into adulthood or a thousand other reasons. Find yours! Two other mindset aspects are worth mentioning. Focus and Patience. Focus is extremely important in the internet marketing world. In just the basics there are several different avenues you can focus on to build your business. In addition there are just as many ways to market and drive traffic to your online site. Every day brings some new and shiny object that with such good copywriters around is bound to make you believe that you need this just to succeed, without it your business is dead. If you can’t find one way to focus your business model on, with just one or two successful ways to drive traffic and make sales, you will never succeed. And Patience is the second arm of that mindset. Patience is what will allow you to stick to your goals, to focus your abilities in one direction and know that in time it will prove itself and provide the income you are looking to achieve. If it doesn’t learn why, was it the area of your focus? Was it the method of marketing? Was it the lack of traffic? Patience gives you the courage to fail and “try, try again”. By now I am sure you can appreciate how important your mindset is to your success. Sherry Fields on Are You Using Neuromarketing?